mountain bike adventures and mishaps: Slippin an a'sliding or what ever happened to global warming? Slippin an a'sliding or what ever happened to global warming? Set off this morning at 5.30am, Baz, Clive and myself, jeepers was it chilly or what! 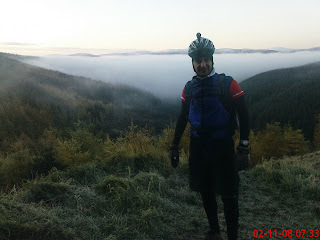 On the way down to Glentress the temperature dropped to -2 Celsius and when we were nearly at Peebles we ran into freezing fog which tends to lie down the tweed valley. Five minutes or so were spent getting lights fixed up and then the compulsory visit to the loos, you don't want to be caught short in sub zero temperatures, (unfortunately Baz, was much to Clive and my amusement). 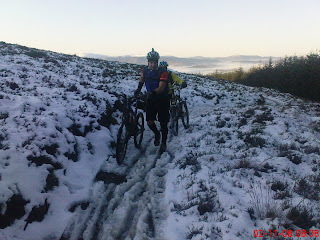 After about the first mile of climbing we emerged from the fog and the views were spectacular, not really done justice on my camera phone, the hills in the distance were capped in snow and the fog twisted its way down the path of the river Tweed. 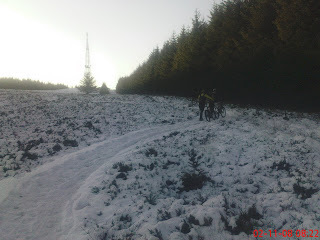 Continuing to cycle up the black route we eventually encountered our first snow of the winter and patches of pretty tricky ice.The higher we went, the more snow there was and eventually it was impossible to cycle on it because of the ruts so we walked the most of the final half mile to the mast at Dunsire Heights which stands at about 2000 feet. The descending was hairy to start with because of the ice but as we got lower the track became safer and the speeds increased. Twenty miles were covered at an average speed of 7.5 mph which considering the conditions was no mean feat. There were the usual minor mishaps but nothing serious and the day ended when Trevor, a biker we met at The Hairy Coo, saw us at the finish and had a chat with us. I still think this Global Warming nonsense has a bit to go before it reaches chilly Scotland!! glad to see Baz wearing his chic winter socks but I hope he was wearing his vest as well.